In December of 2010 Carlos Moreno Vasquez and I visited the Olintla home of the owner of the masks for the Hormegas dance. The owner was not there at the time, but a relative was kind enough to retrieve the dusty masks from their storage place above the rafters and I was allowed to take photos. However, the relative felt that she lacked the authority to grant permission on behalf of the owner for their publication. Later the owner sold an Hormega mask to Carlos which was similar to two others that I had seen earlier and photographed; evidently it had also been part of the group. In contrast to the others, this one was freshly repainted. After considerable study, Vernon and I concluded that there were four masks in that Hormegas dance set that had definitely been carved by Magno León: a mask of Pilato Malo (Bad Pilate/Pontius Pilate), two of the dusty old Hormega masks, and the newly repainted Hormega mask, which shared many but not all of the features of the other two. I added the freshly repainted Hormega to my collection and later I commissioned Carlos to make a special trip to Olintla for the sole purpose of buying or trading for the Pilato Malo mask, which he successfully accomplished. This means that I have two of the masks by Magno León from the Olintla Hormegas dance group to show you today. I will compare Magno’s carving style for these Hormega masks to the styles of two other carvers, Benito Juárez Figueroa and Leopoldo (“Polo”) Cortez González. You will have the opportunity to see that the work of these three is quite similar, but yet each one’s style can be distinguished from the others by careful observation of their back designs. I went to great lengths to obtain this mask because it is so interesting. Despite the title of the dancer who wears this mask—Pilato—this is actually a mask of Satan disguised as Pilato. The clue to this is his ears. 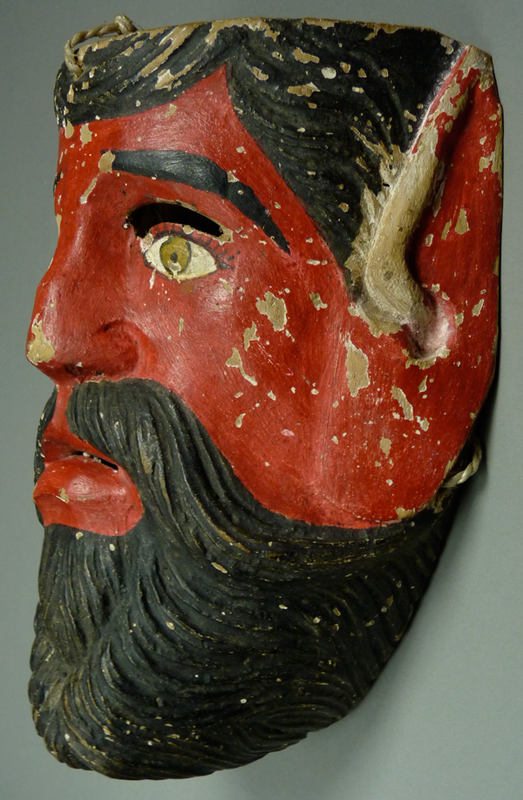 From the masks in an earlier post, we know the typical design used by Magno León to carve human ears, but this mask has the ears of a goat, conforming to the European Christian formula to depict the devil. Although this is evident from the front, it is more obvious in the side view. 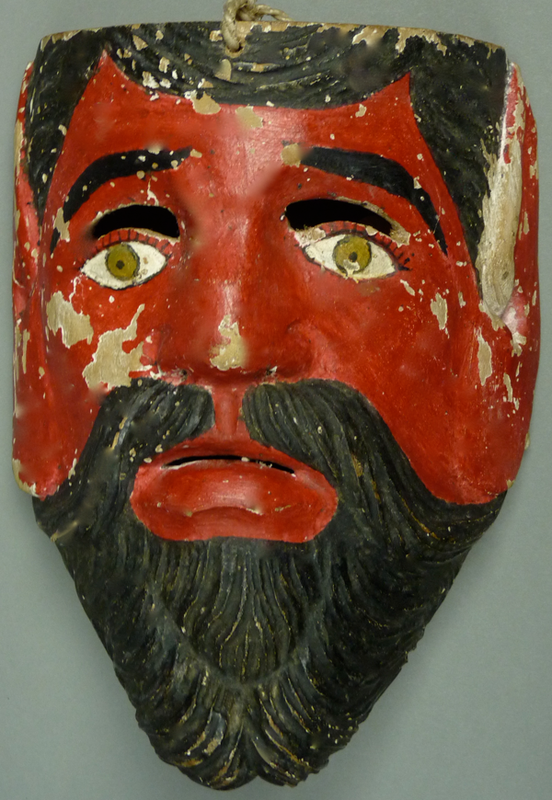 Otherwise, as you will be able to see for yourself, this is a typical example of a high end mask by Magno León, with finely carved hair and beard, arched vision slits with rounded ends, relief carved eyes, his typical nose with a groove underneath, and a carefully sculpted lower lip. Despite the flaking paint, this is a very fine mask. The goat’s ears are very large, extending down to the margin of the beard. This post now ends with an addendum. Last week I introduced you to the masks of Magno León, highlighting a number of features that tend to distinguish his masks from the work of others. There you may have noticed that a particular carver’s masks will share some features and not others, and that two masks by Magno will rarely be identical. 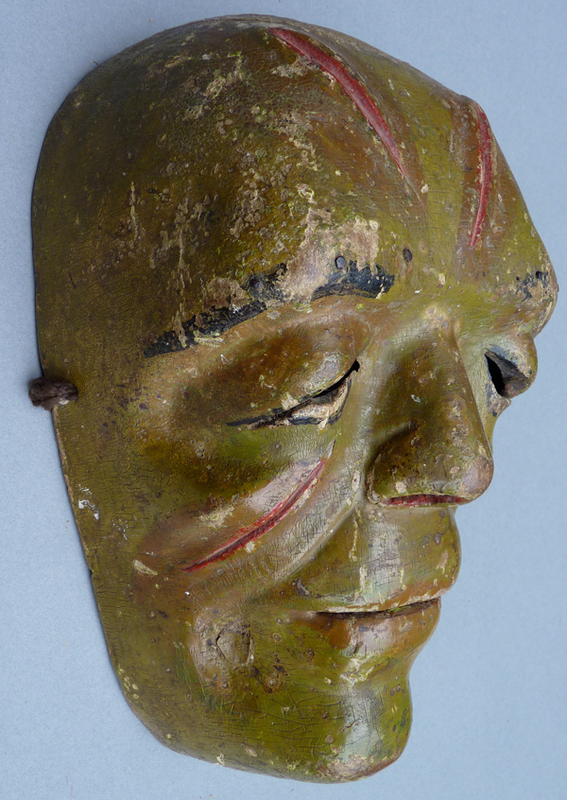 Today I want to present some anonymous masks that I would attribute to this carver, based on overlapping features. During a trip back to the Sierra de Puebla in December, 2012, I became particularly curious about a mask that was said to be worn each year during Carnaval (or Mardi Gras), in the small mountain village of Zapotitlán de Mendez, Puebla, by a dance character known as La Mujer de las Cebollas (the Onion Woman). When I passed through Zapotitlán in the company of Carlos Moreno Vázquez we questioned everyone that we met about this figure and we searched unsuccessfully for an example of her mask. Here is what we were able to learn. The Mujer de las Cebollas character was modeled on rural farm women who lived in remote communities; they visited such towns as Zapotitlán on market days to sell their produce. But since this was a character in Carnaval, her vocation was only the beginning of the story. The dancer who played the Mujer was invariably male, but he wore the mask of a smiling old crone. He portrayed her as irritable and sensitive, prone to swing her broom in the air as she pursued children whom she experienced as disrespectful. Naturally such a character invited provocation from the mischievous, setting in motion an endless and entertaining chase. Obviously the Mujer de las Cebollas was a Carnaval clown. Six months later I received a message from Carlos; he had found a wonderful old Mujer de las Cebollas mask, one that had been danced for about fifty years or more in Zapotitlán. He had also obtained the mask worn by this character’s husband. He believed that these had been carved by Magno León. As I will demonstrate, this impression can be easily validated by comparing the design details of these two masks to the reference standards described in last week’s post. For those of you who watched the dance video of the Danza del Tigre in Xochistlahuaca, Guerrero, in a recent post, it will be apparent that such clown couples—a Viejo and a Vieja (an old man and an old woman)—are stock elements in the dance dramas of Mexico. Here are those two masks, beginning with La Mujer de las Cebollas. 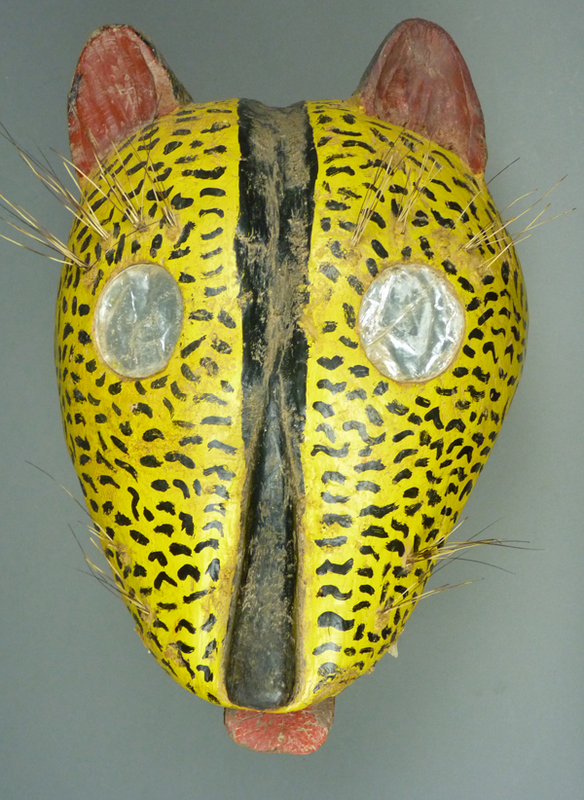 Looking at the face of this mask one sees Magno’s usual relief carved eyes with arched vision openings. But because this is a character mask rather then the more refined face of a Huehue, the rest of the face is rather different from those we saw in the last post. From the side view, the usual ear design is present. The wart on the chin was created with a bead that was nailed to the face. 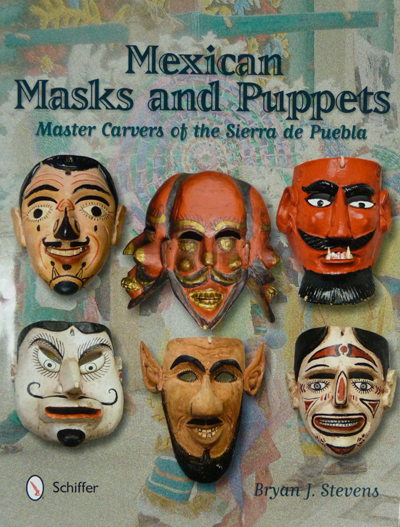 In September of 2012 I published a book—Mexican Masks and Puppets—that was meant to honor the master carvers in a remote area of Mexico called the Sierra de Puebla and to link these carvers to their heretofore anonymous masks. One of the most talented and exciting of those carvers was Magno León. 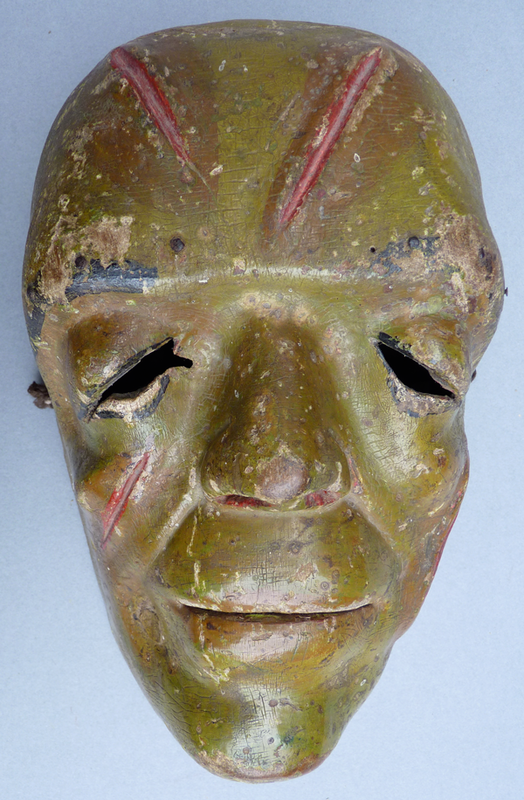 Today I will discuss the initial group of masks that served as my introduction to this carver. This will provide us with the necessary information to discuss three additional masks by this carver in next week’s post; these came to my attention after my book was published and were identified as his work based on the earlier documented masks. Traveling in the Sierra de Puebla in March, 2010 with Vernon Kostohryz and Carlos Moreno Vásquez, we discovered a remarkable anonymous mask. It appeared to have the sagging face of a dead person, reminding us of characters in old horror films such as the Ghoul, played by Boris Karloff in the film of that name in 1933, or perhaps some other role played by Lon Chaney. On reflection, this mask didn’t seem to duplicate any of those faces; instead it was an original creation by some unknown artist. 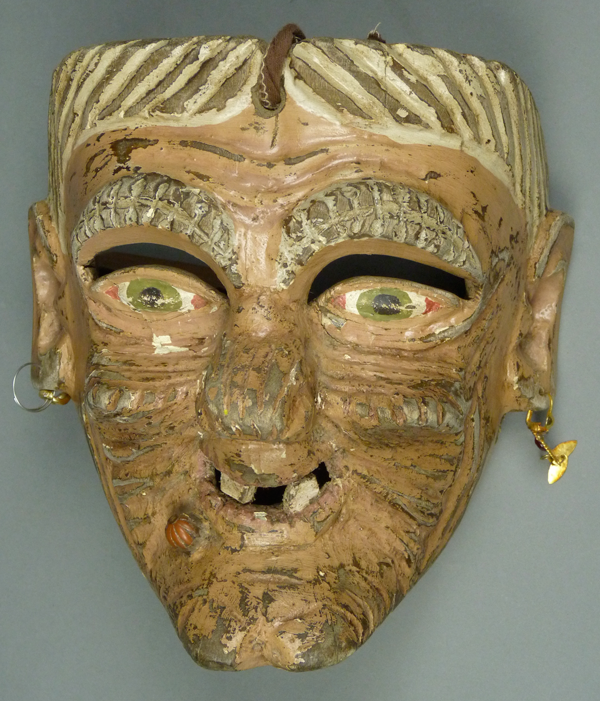 The mask was said to have been danced for Carnaval (Mardi Gras) for more than fifty years. Here are photos of this Ghoul mask. Note the strange sagging eyes, as if the person is barely awake. Of course you can’t miss the aged surface of the paint. This is an expressionless or vacant face, mysteriously drained of human feeling. 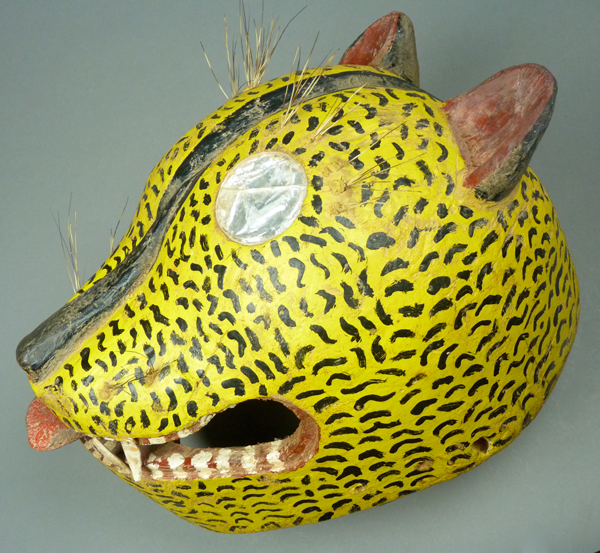 This is the fourth and final post of this series on Tigre (jaguar) masks from Guerrero. It focuses on the masks used for the la Danza del Tigre y los Tlaminques (the jaguar and the townspeople) and the related Danza de Tejón (badger) in the Amusgo region, which spans the border between the Mexican states of Guerrero and Oaxaca. This is a relatively remote area and one finds few Amusgo masks in published works about dance masks from Mexico. There are several major Amusgo towns—Guadalupe Victoria, Tlacoachistlahuaca, and Xochistlahuaca, in the state of Guerrero and San Pedro Amusgos, in the state of Oaxaca. I had shared a YouTube™ video of the dance of the Tigre from Xochistlahuaca in my post about Mexican masks with women’s faces, noting how the dancer wearing a Jaguar mask and suit is quick to menace all those within reach, particularly the other characters in the dance—Don Manuel, his wife Doña Catalina, and their Perro (dog), Cuyuchi. All three repeatedly provoke and attack the Tigre figure, leading him to pounce on them, knocking them to the ground. The bystanders watch these encounters with obvious amusement. Here is a link to the video, which has become one of my favorites. The masks worn by the Amusgo Tigres seem to follow a standardized design. The two masks that follow, which were collected in Guadalupe Victoria in 1995, are quite similar to the one in the video from 2014. In another video, taken in San Pedro Amusgos in 2012, one sees the same Tigre mask again, but this one is made from paper mache. Here is a Tigre mask from one of the Amuzgo towns, Guadalupe Victoria. It has mirror eyes, but no opening for vision at that level. The dancer looks out through the open mouth. This mask is 11 inches in height, 8 inches in width, and 6 inches in depth.